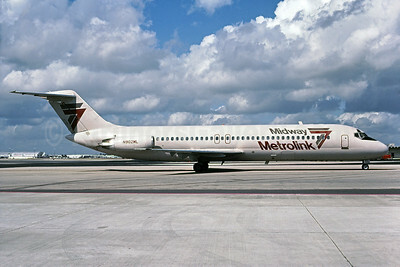 (Midway Metrolink) (ML/MID) (Chicago-Midway) 1979 - 1991. Photos. Framable Color Prints and Posters. Digital Sharp Images. Aviation Gifts. Slide Shows. Midway Airlines (1st) Boeing 737-2K9 G-DFUB (msn 22415) (Monarch Airlines colors) MIA (Bruce Drum). Image: 102523. 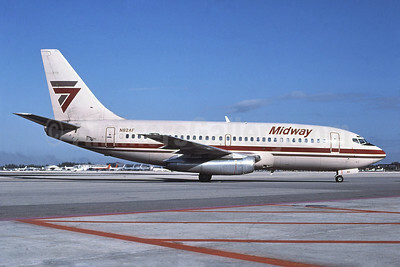 Midway Airlines (1st) Boeing 737-2K9 N701ML (msn 23405) MIA (Bruce Drum). Image: 102522. 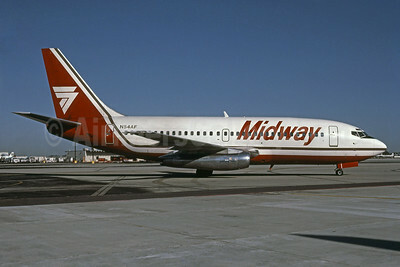 Midway Airlines (1st) Boeing 737-2T4 N54AF (msn 22055) MIA (Keith Armes). Image: 906707. 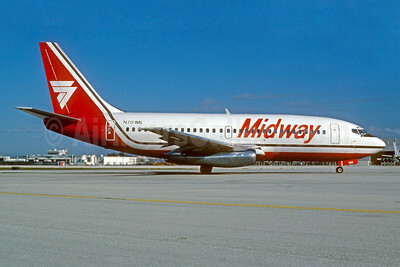 Midway Airlines (1st) Boeing 737-2T4 N82AF (msn 22698) (Midway Express colors) MIA (Bruce Drum). Image: 102520. 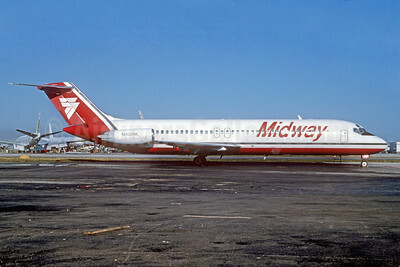 Midway Airlines (1st) Douglas DC-9-15 N1064T (msn 45778) PHL (Robert Drum). Image: 102519. 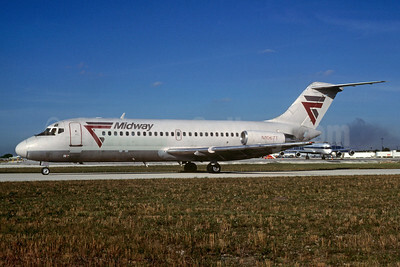 Midway Airlines (1st) Douglas DC-9-15 N1065T (msn 45779) MIA (Bruce Drum). Image: 103158. 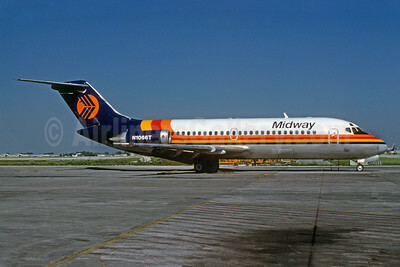 Midway Airlines (1st) Douglas DC-9-15 N1066T (msn 45780) MIA (Bruce Drum). Image: 102517. 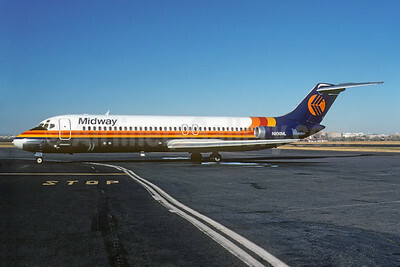 Midway Airlines (1st) Douglas DC-9-15 N1067T (msn 45781) (Midway Metrolink colors) MIA (Bruce Drum). Image: 102518. 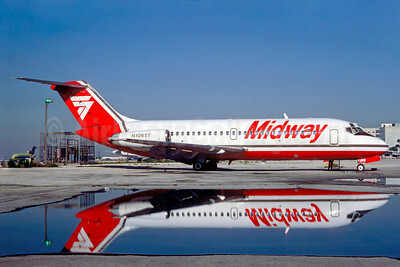 Midway Airlines (1st) Douglas DC-9-15 N1070T (msn 45784) (Christian Volpati Collection). Image: 921227. 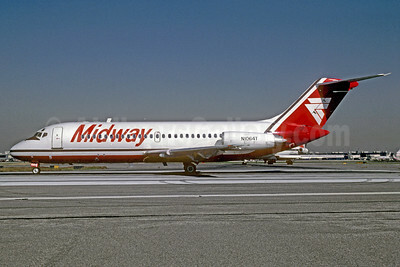 Midway Airlines (1st) McDonnell Douglas DC-9-31 N930ML (msn 47527) DCA (Jay Selman). Image: 402247. 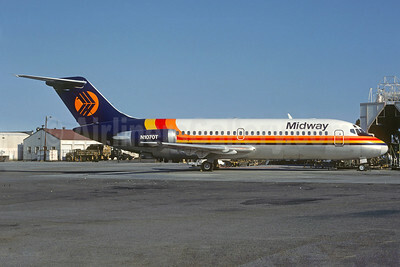 Midway Airlines (1st) McDonnell Douglas DC-9-31 N930ML (msn 47527) MIA (Bruce Drum). Image: 102521. 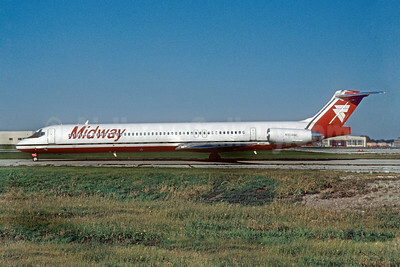 Midway Airlines (1st) McDonnell Douglas DC-9-31 N8924E (msn 45839) MDW (Ronald A. Kluk). Image: 909277. 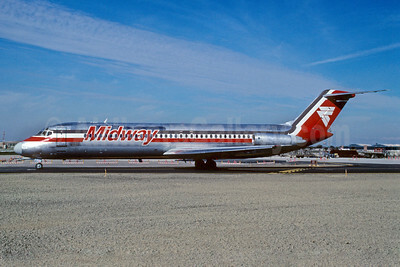 Midway Airlines (1st) McDonnell Douglas DC-9-87 (MD-87) N802ML (msn 49725) MDW (Ronald A. Kluk). Image: 909278. 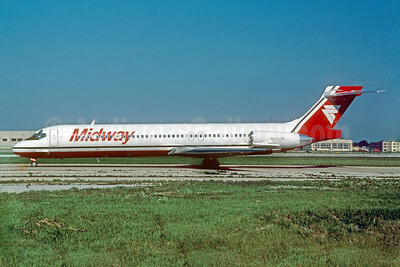 Midway Airlines (1st) McDonnell Douglas MD-88 N904ML (msn 49766) MDW (Ronald A. Kluk). Image: 909279. 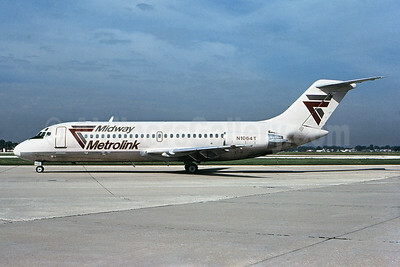 Midway Metrolink Douglas DC-9-15 N1064T (msn 45778) MDW (Bruce Drum). Image: 102524. 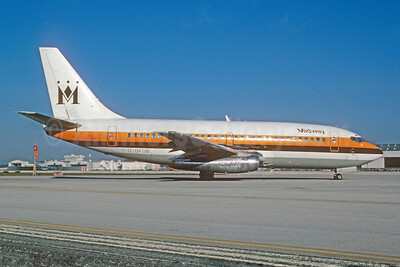 Midway Metrolink McDonnell Douglas DC-9-32 N902ML (msn 47105) MIA (Keith Armes). Image: 909080. 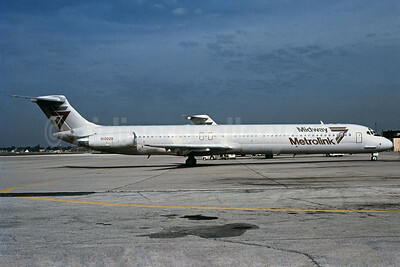 Midway Metrolink McDonnell Douglas DC-9-81 (MD-81) N10029 (msn 48049) MDW (Bruce Drum). Image: 102521.